There is a story . . . we don't know just how true it is . . . that people in one small village in China noticed that the massive mountain that shadowed their community, was getting smaller. They could not understand why or how such a thing could happen. Then one day, someone climbed the mountain to take a closer look and discovered that it was really a tower of melting ice. Their mountain was, in reality, a glacier that had gotten so covered with snow and other debris they did not know it was made of ice. China is such a vast nation, and blessed with so many majestic mountain ranges, that its people have enjoyed no less than 46,298 glaciers. For centuries these massive blocks of ice, high on the peaks, have drained and provided fresh clean water for the farmers, villagers and townspeople on the lands below. 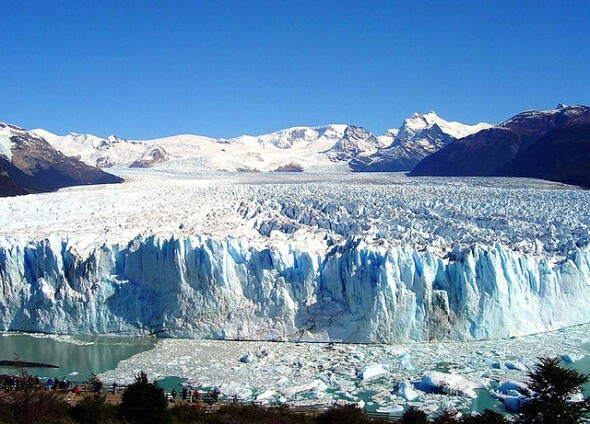 Now, because of our polluted air, global warming and dynamic weather changes, those glaciers are on melt-down. Every single one of them. There is a general warning that at the rate the glaciers are receding, they will all be gone within the next 100 years; or possibly in less time than that. And this is already having its effects on the people who depend on the water from those melting ice caps. The glaciers on the Anyemaqen Mountain range, for example, feed the mighty Yellow River which, in turn, provides water for hundreds of millions of people. Records show that just one of these ice blocks, the Halong Glacier, has shrunk from six to five miles in length since 1981, and retreated by several hundred yards just since measured and photographed by Greenpeace in 2005. A reporter for the San Francisco Chronicle talked to Namgyal Tsering, a 22-year-old sheep herder on the Qinghai-Tibetan plateau, just below the Halong Glacier. He said he notices the weather is much warmer now than when he was a child, and the grass is shorter. He said many of the people who once made their living raising sheep in the area have moved into towns. The Chinese government has moved thousands of nomads like Namgyal from the plateau into local towns, giving them free housing and 8,000 yuan, or just over a thousand dollars a year on which to live. Elsewhere in China, the nation's industrial revolution is now in full bloom, and people are beginning to realize a sense of a prosperity they never had before. They are buying cars, CD players and adopting an American capitalist life style that is having a negative impact on the local environment. China just this year overtook the United States as the world's number one source of greenhouse gas emissions. That means China is contributing more to its own global warming issues than any of the other world nations, and is only recently starting to do anything to control the problem. People living along the coast have been hit with severe typhoons, monsoon rains, flooding, heat waves and other forms of violent weather. Much of China is impacted by drought, and desert areas are expanding. Deaths from floods, lightning and mudslides across China have been counted in the hundreds this year alone. And this is just China. Similar issues are going on all across Asia, Europe, Africa, North and South America and Australia.